As experiments piled up — let’s try this, what if we try that — the contraption met every challenge, and doors long closed to scientific inquiry sprang open. A new age of engineering, the Age of Soft Matter, had arrived. As Angelini worked, he updated colleague and mentor Greg Sawyer on the eerily soft objects coming out of his lab. Sawyer issued a challenge. 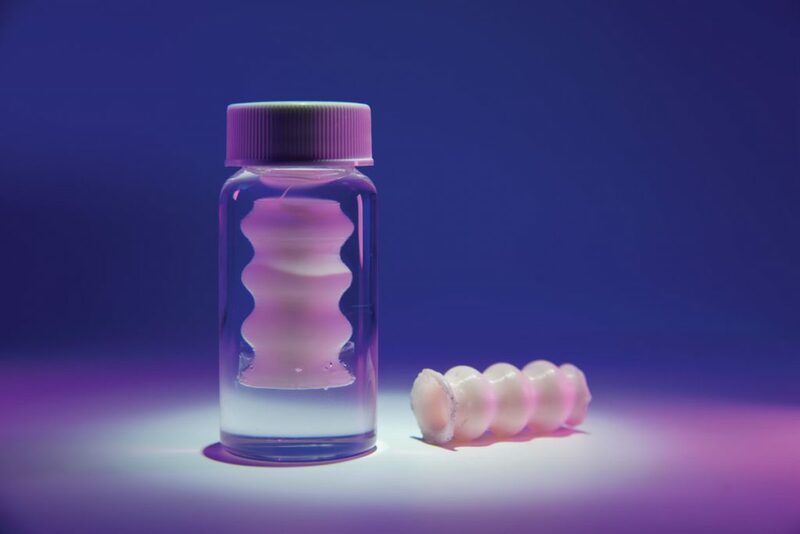 As a symbol of a new age and an engineering revolution that will change medicine and manufacturing, the no-longer-impossible jellyfish is perfect. If you can make a jellyfish, think what else you can make: cells, tissues, organs, tumors. Before the jellyfish, there was a grant. Angelini had won a National Science Foundation Early Career Development Award, NSF’s most prestigious award for promising junior faculty, with a proposal to use the $500,000 to explore cell mechanics. To do that, he needed arrays of cells not confined to a petri dish. He needed cells in three dimensions. Tommy Angelini uses his lab’s refrigerator for quick calculations. 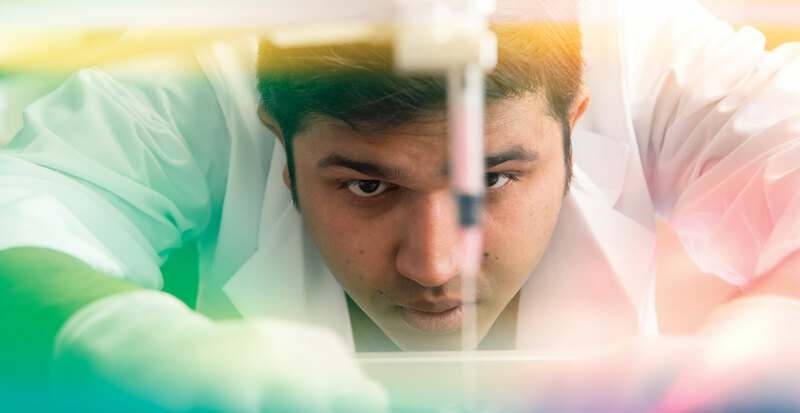 Angelini hired doctoral student Tapomoy Bhattacharjee and drew on assistance that ranged from a high school student working on a science fair project to Sawyer, a world-renowned tribologist and the Ebaugh professor in the Department of Mechanical and Aerospace Engineering. Angelini bought a see-through laminar cabinet commonly used by geneticists because it had a way to filter air. He procured a fine-tipped nozzle like those used in 3-D printers. All he needed was a way to hold the printed cells in place; in other words, something that did not exist. In traditional 3-D printing, the nozzle deposits liquid on a platform, and it hardens layer by layer until an object takes shape. That method would not work with something as squishy as a cell, which could not harden and would not be supported in air. Angelini needed a specialized material, one soft enough to allow the most fragile object to take shape, but strong enough to hold it in place, so it could be studied and manipulated. The substance had to be neutral, neither contaminating nor augmenting the object it cradled, and it had to be soluble so it would rinse off, leaving no trace. It was a tall order, but Angelini figured a granular gel medium might work. You know it as hand sanitizer. The granular gel medium is the same as hand sanitizer without fragrance or alcohol. It straddles the solid-fluid states that Angelini needed to both hold a fragile object and later release it because the substance is 99.8 percent water. The other 0.2 percent is a polymer. As the nozzle passes through, the gel heals in its wake, leaving no sign of disturbance other than the soft, printed object, visible through the clear gel. The intended goal — studying cells in 3-D — had an unintended, but groundbreaking, consequence — the invention of 3-D printing of soft matter. 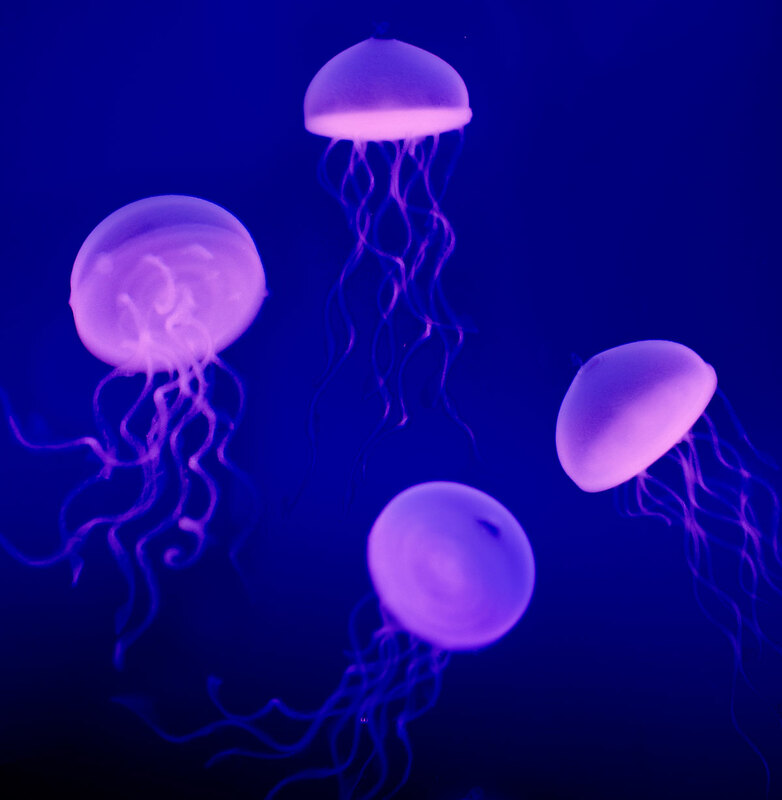 As word spread across campus, the kneejerk reaction was, “No, that isn’t possible.” As chemists, biologists, neurologists, doctors and engineers trooped through Angelini’s laboratory, Bhattacharjee demonstrated, printing jellyfish after jellyfish, filling an aquarium with polymer creatures. Sawyer and Angelini had suggestions. In 2015, the American Cancer Society estimates 1,658,370 cases of cancer will be diagnosed in the United States; 589,430 cancer patients will die. By 2020, treating cancer will cost the U.S. over $200 billion a year. Perhaps more staggering than the statistics is cancer’s reach. Every family has a cancer story, and that makes cancer a grand challenge for medicine. 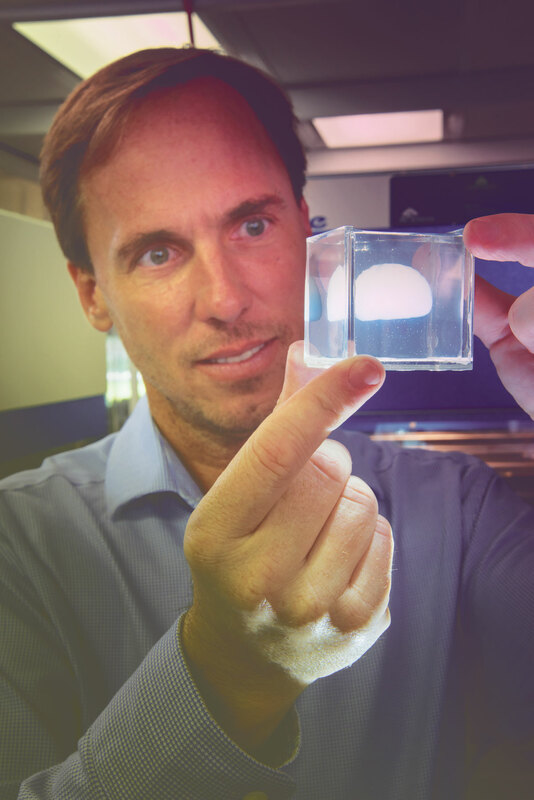 Greg Sawyer examines a small-scale, soft matter model of a brain. For Sawyer, it’s a personal challenge as well. In 2013, Sawyer was diagnosed with stage IV metastatic melanoma. At first he felt helpless but, being an engineer, he did his homework. He joined a new immune therapy clinical trial, had a trio of painful operations and months of intense radiation to fight the disease. When Angelini printed the jellyfish a year later, the intersection with cancer was clear. When the College of Medicine’s Celebration of Research rolled around, they browsed the posters at the O’Connell Center to see if they could find a collaborator. They ran into cancer researcher Steve Ghivizzani. Ghivizzani did think about it and emailed Sawyer that night. He was in. Cancer has been a thorny research subject because it is a chameleon. A cancer cell in one person doesn’t behave like a cancer cell in another, even if the cancers are the same. Even more confounding, each tumor is heterogeneous. On its exterior, it might be gorging on nutrients and replicating rapidly. Deep inside, it may be almost starving, but still alive, waiting for nutrients before growing. With thousands of cancer cells in each tumor, figuring out how the cells interact will be a key to future cancer treatment. Ghivizzani says a tool that could allow cancer research to take not one step, but possibly many giant steps, got him excited. Cancer researchers have been stuck for years with two models, the petri dish and the mouse. Cancer cells are easy to grow in a petri dish. But the biology of a cell growing in a dish is different from the biology of a cell growing in a body. In the body, cancer cells compete with other cells for nutrients, exhibiting aggression, or malignancy. In a petri dish, without competition, they adapt to their environment and often lose the malignancy a researcher wants to study. Ghivizzani says about two-thirds of the genes expressed in a tumor in the body are expressed in opposite ways in a petri dish. The other model is the mouse, but that, too, has limits. Many cancers don’t grow in mice, prostate cancer, for instance. Most mice used for cancer research also have been genetically engineered to suppress their immune system, so immune therapies cannot be studied. Cancer grows slowly in mice, if at all, and sometimes the patients succumb before the mice can be tested. To see inside the mouse, you have to sacrifice the animal and further study of the tumor. What is needed is a three-dimensional model between a petri dish and a mouse: 3-D soft matter printing of cancer cells. The goal is to harvest a patient’s cancer cells, print them into the granular gel, and allow them to grow. In theory, unlimited samples could be grown and an unlimited number of therapies tried. Researchers couldn’t use 10,000 mice at once, but they could grow 10,000 samples and try different approaches. From immune therapies to various drugs, all the tests could take place at once, saving critical time for the patient. Ghivizzani says the ability to collaborate with engineers on cancer research is key to reaching that goal. Working with Sawyer and Angelini one afternoon during a test, it looked like they would not be able to print fast enough to continue working the next day. Sawyer, who feels the urgency of his fellow cancer patients every 100 days when he visits his doctors, says engineers are perfect partners for cancer research. By January, he says, UF engineers will equip a lab at the College of Medicine with engineering tools for new research. “At first, cancer seemed far from engineering. But look at it; it’s a dynamic system, far from equilibrium, and maybe that’s not so strange to engineers. This is tumor engineering. Give us six months, and we can really help from an engineering standpoint. 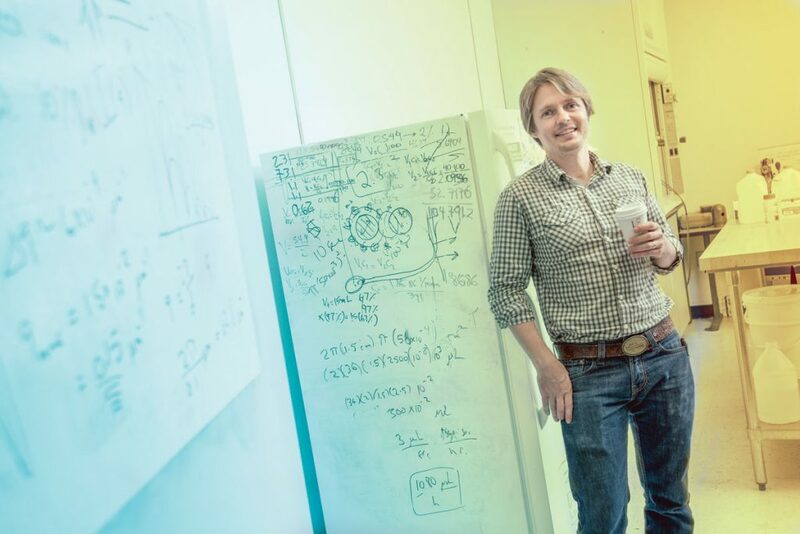 “Ten years from now, I think this will be the way researchers work with patients’ cancers,” Sawyer says. A new age of engineering creates a lot of work, and Sawyer and Angelini were eager to share the cool, new science. Department Chair David Hahn agreed to a Soft Matter Engineering Research Group, and the scientists who witnessed the first jellyfish demonstrations signed on. Today, there are 28 collaborators, including two Sawyer protégés at the University of Illinois Urbana-Champaign and Florida International University. Teams of engineers and doctors will tackle four areas: mechanics and failure theories of soft matter; soft matter manufacturing; transport of materials through soft matter; and soft matter for medicine. The objects printed in the lab are orders of magnitude softer than any man-made object. Angelini says he doesn’t know of a lower limit to the mechanical integrity of the objects the lab can make, and Hahn says new mechanics and failure theories will be needed; what works for titanium will not work for cells and polymers a million times softer. Angelini’s lab did informal tests. One early jellyfish was placed in a jar and examined weekly. It held up just fine until, at the seven-month mark, it was knocked off a shelf. On impulse, Angelini tossed a container of polymer jellyfish in his backpack to travel to a conference in Germany. They survived, so he sent them by FedEx to a colleague in Cleveland and had them shipped back. The jellyfish were no worse for wear. Now it’s time for science to back up — or disprove — the anecdotes. Sawyer, the go-to guy for expertise on friction and wear in mechanics and materials, says what engineering has lacked from the Stone Age to the Plastics Age and beyond is softness; soft materials have always confounded engineers. “I didn’t realize that at that very moment, one of those revolutions was taking place across campus,” Jones says. That there is no textbook for this field that didn’t exist six months ago is an opportunity, not a problem, Jones and Hahn agree. No one is waiting for theories. Across campus, scientists are making soft materials at such a pace that six patents are pending on a technology not yet a year old. The lead in manufacturing is Curtis Taylor, assistant professor of mechanical and aerospace engineering. Already, Taylor is close to solving one of the first questions raised by the new technology: Is it possible to print efficiently with more than one material? Early experiments involved printing with a single material, in most cases polymers or cells. What if you wanted to print an object with different textures at different layers — a phantom brain, for instance, with a tumor under the surface? Taylor and a team of students tackled that problem. They came up with an acrylic tube with four ports, one for the granular gel medium and three for other materials. To avoid the need for a valve to shut off one port so another can open, they came up with an ingenious solution: use the granular gel, which easily transitions from fluid to solid, as a plug. The device is the size of a piece of bubblegum and would cost just $2. To make cellular or sterile materials implanted in humans the device is disposable, and although the prototype is acrylic, biodegradable materials work, too. As a manufacturing innovation, it looks simple, but it’s a workhorse. “This little device replaces four nozzles, four pumps, four different needles, four different mechanisms for putting the needles into the gel,” Taylor says. The printed soft materials can mimic the softness of human body parts, like the brain, and that opens new avenues for medical education, says neurosurgery professor Frank Bova. A prototype of a hollow, flexible tube that represents on-demand, patient-specific medical devices. By manufacturing artificial brains and other phantom organs that students can practice on, medical education could take a leap forward, Bova says. Models of bones and cartilage have been readily available for practice, but not soft organs. One problem with teaching medical students is having the right case at the right time. Often, complicated cases come in when a student is learning more basic methods. Bova envisions a library of phantoms, easily printed as needed, giving students cases appropriate for their skill level as their skills grow. Other phantoms could benefit personalized medicine. A patient’s brain could be scanned and printed with its own personal architecture — tumors, blood vessels, neurons — allowing the surgeon to rehearse before operating on the patient. Some colleagues are stunned by the simplicity of his idea and how easily it adapts to different uses. But that’s engineering, Angelini says, the best solutions are simple and elegant. “Every time we thought of a new thing to do with this technology, it turned out to be really amazing. Every time we thought of a new task or a new test, the material we were using turned out to have a fantastic solution,” Angelini says. The jellyfish — the impossible jellyfish — was almost too easy, but the road ahead holds challenges. “I think we will help people,” Sawyer says. “This may not help me, but it will help somebody.